At a time when arts education is under siege nationally — forget the frills! teach engineering and coding! — Westport is offering its students something else. A chance to compose music with Sean O’Loughlin. The award-winning composer/arranger/conductor — he’s got over 200 compositions to his credit, and has collaborated with Adele, Josh Groban, Itzhak Perlman, Pentatonix, Kelly Clarkson and others — is in the midst of a unique project. His collaborators: 6th, 7th and 8th orchestra students at Bedford Middle School. A Westport Public Schools Innovation Grant funds the effort. The grants give students and staff the chance to think outside the box, using creative new ideas. The relationship began last year, when the 6th grade orchestra Skyped with O’Loughlin during rehearsals of one of his pieces. 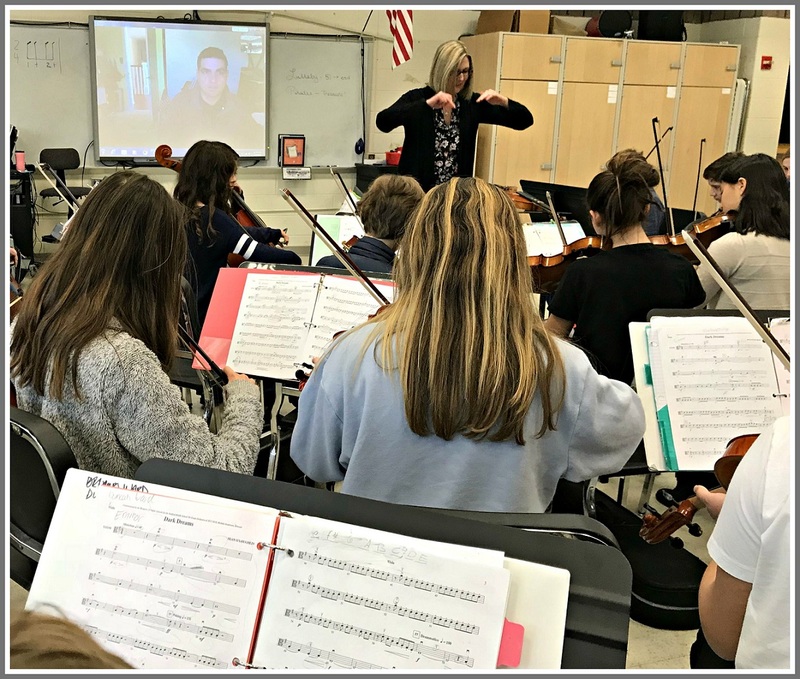 Last summer, BMS music teachers Michele Anderson and Anthony Granata asked the composer to continue the connection. He was happy to oblige. This past November, string students explored the music-writing process. They looked at tempo, mood, style, even titles for future pieces. Next — via multiple Skype sessions — they offered O’Loughlin suggestions for key and time signatures, bowing styles and advanced techniques. Afterwards, students discussed and wrote about those interactions. Michele Anderson rehearses her Bedford students. Composer Sean O’Loughlin watches in the background, via Skype. Based on their input, O’Laughlin then created 3 unique pieces. In early January, he sent his original compositions to the very excited Bedford students. Since then — again by Skype — the youngsters and O’Loughlin rehearsed together. As they did, they asked questions and shared ideas. On Monday, the musicians met O’Loughlin in real time. 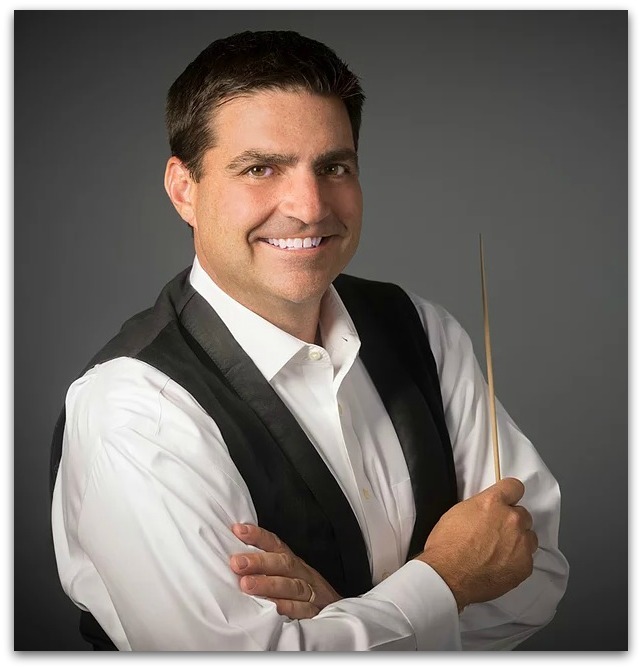 He came to Bedford from California, as a composer/conductor in residence. He rehearsed the students, and gave a presentation. After an exciting day, all orchestra students gathered for a performance conducted by O’Loughlin. Music educators were invited to watch the creative process in action. Sean O’Loughlin conducts the Bedford orchestra. “Because these pieces are brand new, our BMS orchestra students were the first ones to interpret the music in their very own way,” Anderson notes. The process is working well. And in May, the middle schoolers will share their work with the public. The prestigious Carl Fischer music company will publish the compositions. They’ll be available to schools across the globe. Bedford’s spring concerts — when they’ll debut the O’Laughlin pieces — are set for May 1 (grade 6), May 3 (grade 7) and May 14 (grade 8). They begin at 7 p.m. in the school auditorium, and are free. This entry was posted in Arts, Children, Education, Entertainment, People and tagged Anthony Granata, Bedford Middle School orchestra, Michele Anderson, Sean O'Loughlin, Weestport Public Schools Innovative Grant. Bookmark the permalink. I had the privilege of listening to the students perform all three pieces at the end of the school day yesterday with Mr. O’Loughlin conducting. The pieces are rich, dramatic, and challenging, and I was so proud of our school! Kudos to the students, the Westport Music Department teachers, and the very supportive administrators. This collaboration has been unique and joyful!